Here, we see an interesting trend—Rendon is swinging at more pitches, but making less contact compared to last season. In fact, he is swinging more at pitches outside of the zone, which is also flies in the face of his slight uptick in walk rate in 2014. 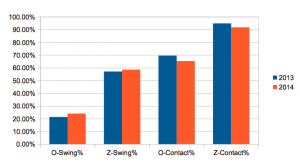 Despite the slight rise in chasing pitches outside of the zone, he still shows the most restraint when comparing his O-Swing rates to his Nats cohorts; Rendon trails only Adam LaRoche and Jayson Werth with respect to Z-Contact rate (89.6% versus 90.6%), but leads the team in overall contact rate, connecting with 85.6% of pitches he has seen. The colors are a tad misleading for 2014 simply due to sample sizes—he is still making lots of contact and getting hits on pitches in the strike zone. 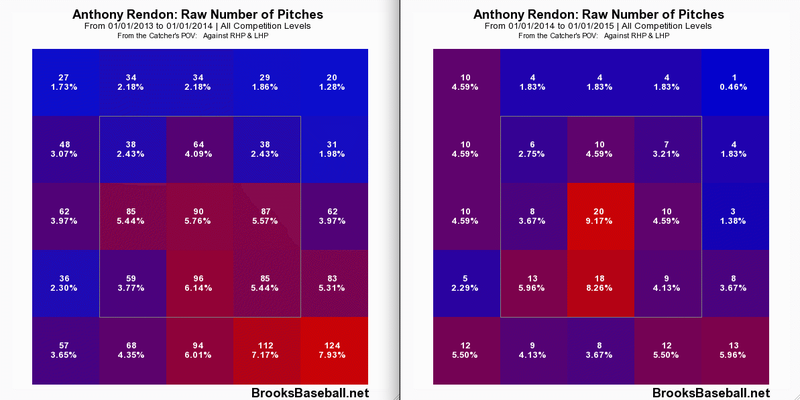 However, we also see that Rendon is taking those inside, slightly off the plate pitches and doing more with them this year, which is not only reflected here, but in his BABIP, currently at .386. Let’s discuss BABIP briefly. Overall, the stat doesn’t have a strong year-to-year correlation, so the chances of Rendon maintaining and continuing his current average isn’t likely. However, popup rate (PU%) is pretty correlative year to year and is also relatively predictive of BABIP. It is also a nice way to gauge how hard a hitter is hitting the ball. With this in mind, we can take a look at Rendon’s popups and not only see the potential of his BABIP to remain above average, but also how well he is hitting the ball, not only in terms of accumulating base hits, but also how hard the contact he is making really is. To put this into contrast, Joey Votto had a 0.22 PU% in 2013, having had one IFFB; teammate Bryce Harper had a 2.1% popup rate. Comparing him to a similar hitter in terms of BABIP, Manny Machado had a 5.1% popup rate. For 2014, Rendon, like most of the league, has a 0 PU%, so we can’t really say much about popup rate improvements just yet, as we simply don’t have enough data points. However, this correlation is something to keep in the back of our minds as the season progresses. However, looking at last year’s numbers, we do see Rendon as someone who projects to hit the ball hard as he continues to develop. While these gifs aren’t the best for comparison given the first is on a fastball, while the second is on a curveball, it does show the changes in how his hands and feet are set and work throughout his approach. With that caveat noted, it appears that Rendon has also removed some extra movement with his lower half, making an already compact swing quicker, allowing him to cover all corners of the plate and also turn on those high and tight fastballs he appears to be getting more of in 2014. Despite counter intuitive statistical changes from this season to last, we see an improved approach by Rendon, possibly brought on by some slight mechanical tweaks. He is not only taking what he is given in terms of pitches in the strike zone, but is also showing pitchers that he can turn on the inside pitch, thus opening up the outside corner for Rendon in future at bats. In terms of his BABIP and the ability to consistently make hard contact, the trends bode well; however, it’s a little to early to say with much conviction whether the BABIP we have seen from Rendon in the first month of the season will remain through the year or his career, but nonetheless, we should enjoy the show one of the best pure hitters in the game is putting on.